Air Force One - why is it so expensive? The US government is set to spend an estimated $3.2bn (£2.54bn) on the project that will replace Air Force One - and Donald Trump is not happy about it. The president-elect suggested it's time to cancel the order - after all, one new model costs a mere $378.5m to buy, if you're an airline. So why is the world's most famous aeroplane so expensive? Air Force One is, technically, not a plane. It's a callsign - the name given to any Air Force craft that has the president on board. Since the president rarely travels on a budget airline, it's almost always used to refer to a modified Boeing 747-200: a military aircraft built specifically for the commander-in-chief. The current model entered service in the 1990s and is at the end of its life - so a new craft, based on the Boeing 747-8, has been ordered by the US military. 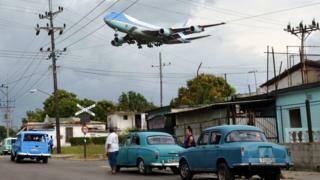 To say the president flies in a 747-200 does not paint the full picture. Air Force One's designation is actually VC-25A: a military plane. The commercial skeleton is essentially custom-built to transform it, in the White House's words, into "a mobile command centre in the event of an attack on the United States". The budget sheet for the replacement plane includes upgrading all the electrical systems to military grade and twin backup power systems, for example. Those upgrades mean Air Force One is shielded against an electromagnetic pulse (EMP) - a type of energy burst that can damage most electronics. It's a side effect of nuclear weapons detonated at high altitude. Other upgrades include military communications equipment and the "self-defence system". That probably means electronic countermeasures to throw off missiles - though the US Air Force doesn't go into detail. Photos of the current Air Force One are shared by military aviation enthusiasts online, speculating on what exactly is behind all the panels on its tail section. All of this doesn't come cheap. In fact, the first step in the process is to just buy two 747-8 commercial aircraft - only then does the actual design work begin. Two aeroplanes are required, even for only one president, to ensure that whenever one plane is under maintenance, the other is ready to fly. In an interview with Rolling Stone last year, Mr Trump boasted that his own private jet was "bigger than Air Force One". Mr Trump's 757-200 is smaller in every dimension than Air Force One. According to Boeing's own specifications, Air Force One is a whopping 231ft 10in (70.6m) long, with a wingspan of more than 195ft (59.6m). Mr Trump's plane is just 155ft (47m) long and has a 134ft (40m) wingspan. Air Force One beats the private jet in raw aeroplane power, too. It has a far longer range than most aircraft - enough to go from Washington to Hong Kong in a single flight. It can refuel in midair as well - leading the White House to claim it has "unlimited range". Air Force One may not have the gold-plated belt buckles of Mr Trump's luxurious jet - but has plenty of perks itself. The current jet has three floors and a massive 4,000 sq ft (400 sq m) of floor space. That includes a private office for the president, a conference room - even a gym. The two food galleys are staffed by a team of chefs, with a fully outfitted kitchen which can feed 100 people at once. Preparation is done by military chefs who seal all the ingredients for safety. When the BBC's Jon Sopel flew as part of the press pool, dinner was filet mignon - with special presidential M&Ms for afters. The journalists who fly with the president - just 13 at one time - are meticulously screened by the secret service before the flight and placed inside "the bubble" with an armed Secret Service agent, where their movements are controlled. That kind of security extends throughout the craft. The president's quarters at the front of the plane are accessed by a corridor with two chairs, where Secret Service agents are always stationed. The plane also holds a medical suite which can function as an operating room, and a doctor is always on board. All of this, of course, adds to the expenditure on the president's private plane. Operating Air Force One costs in the region of $180,000-$200,000 an hour, according to most estimates. That's something Donald Trump criticised when Mr Obama was jetting off to support Hillary Clinton during the election campaign. (Ms Clinton's campaign said it would contribute to the cost). If Mr Trump wants to cut down his travel costs as the president elect, buying the jets is only the beginning.